At Shark Reef, you'll encounter more than 1,200 different species of sharks, tropical and fresh water fish, reptiles, marine invertebrates and rays totaling about 2,000 animals among 2 million gallons of seawater. This is an the aquatic experience of a lifetime. Book online to save! Get away from the hustle/bustle of the strip, to the serene Shark Reef exhibit at Mandalay Bay. Sharks are online one feature of this incredible attraction. Save when you book your Shark Reef tickets online today! Tickets start at $20/pc before taxes and fees. Tropical fish, fresh water fish and 9-foot long sharks all call the aquarium at Mandalay Bay home. 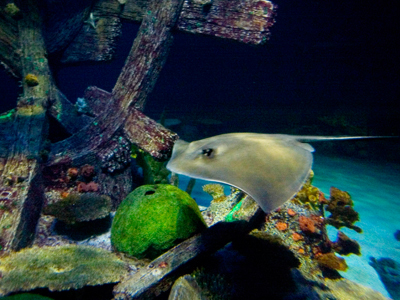 The underwater attraction looks like a shipwreck sunken into the 1.3 million gallon tank. You won’t want to miss the giant turtle, the Komodo dragon or the fierce piranhas. The beautiful schools of fish are a magical sight to see. You will not only get to see these amazing creatures, but you will also have a chance to learn in-depth information and fun facts. This is something the whole family will enjoy seeing and a learning experience too. Tying the knot? Have your wedding at the Shark Reef Aquarium and invite all 2,000 sea creatures to watch. For the brave, try the Dive with the Sharks Program. Try the various animal encounters including sea turtle feed, stingray feed and shark feed, which are additional tours at an additional cost. Enjoy the new Polar Journey with your Shark Reef Admission! This interactive experience gives guests a glimpse into the Earth’s polar regions and the animals that call them home. This was worth the money for us. It was a cheap and fun way to see animals. My kids were all for it! It was a little crowded for my liking. They allowed us to take pictures which I really liked. I captured some great moments. I would definitely go here again! I felt like the tickets were a little overpriced, but I still enjoyed it. I liked how you could pet the sting rays. And the shipwreck was really cool too! Tour was short and not worth the money. Go see Bodies or Secret Garden instead. This was a nice break from the other things we were doing. Not a bad price but there were quite a few people so walking through was a little frustrating. Also was hard to get to the glass to get close. Other than that the stingrays were a great experience since we were able to “pet” them. There we several small sharks and we were fortunate enough to see the elusive turtle. I would go again with someone who hasn’t been there before. But not on my own since there are to many other things to do. I loved everything about it. They allow pictures all through your visit. They provide friendly, knowledgeable staff with fun and interesting facts. You can let the stingrays and there are many different amazing creatures!! The shipwreck Is quite lovely, and the tunnels a very nice addition, making you feel closer to the sharks! Although its a nice trek through Mandalay Bay, it’s a wonderful, relaxing way to spend an hour away from the hustle of the strip! Adult tickets are $18 each. I found it all fascinating! They had a very nice piranha display, a place to pet stingrays, very knowledgeable staff. The shipwreck is a such beautiful scene! Nice and relaxing after the hustle of the strip. It’s a good walk through Mandalay Bay, but for $18 it’s a nice, relaxing way to spend about an hour of the day. It fun to walk and watch the fish swim around walking down the path to see the fish is great fun watching the sharks swim around. It’s great fun to touch the fish in the little tank to. It was only $18 but so crowded, typical selfish people staying in one spot not budging for a person who just wants a glance or a photo. Whole thing took less than 20 minutes to go through. $18 an adult not awful but too much for just a short walk through. Was told by staff there was this fish, that type of this and that but I did not see any at all. Very crowded, kids running free, come on parents pay attention to your kids! We travelled al the way to the south strip to see this it is miles from the front of the hotel. I found it pricey just to look at the animals, it was rather boring actually and very expensive! Hubs and I took the kids… can’t remember what we paid exactly per ticket, but I remember it was quite pricey. Was very disappointed with what I saw as they did not have much to offer at all. Kids were unimpressed as well, they were bored within 10 minutes. I would not recommend this venue. Your money is best spent somewhere else. Not worth the money. Attraction made to seem way bigger than it was no big sharks or sea turtles. The shark reef aquarium was definitely worth the money. It was a cheap fun way to spend some time relaxing and watching all the various animals. It’s not as much as I thought it would be but it defiantly was fun. The sting rays were amazing and so was everything else.